I need a water bottle cozy. No ifs, ands, or buts about this one. I know we are all encouraged to stay hydrated and use a water bottle but when I drink water my preference is for cold water. Like cold with ice! This can be a challenge when you’re using a water bottle. I’ve tried partially freezing the water bottles. This is successful but ultimately hard on the water bottles. They bulge, they crack and leak..oops and they can melt too slowly or too quickly depending on the weather or the activity and the amount of frozen water. I’ve tried partially freezing, tipping them on the side and freezing and even filling them halfway and freezing. It really is an ok process but does seem to shorten the life of the water bottle. I also don’t like it when they start to bulge on the bottom and then rock when they are set on a flat surface. My solution has been to fill the water bottle with ice cubes. The result of ice cubes and also of freezing is condensation. The condensation can be a mess. You get water marks on tables on clothes and if you’re outside, you can even make mud! I’ve tried various solutions. Here again, all successful to a degree but not perfect. The first one I tried was a sweat band like you would wear at the gym. Sweat bands are functional but are not really good-looking so that is a solution but not my preferred one. The next option I tried was a water bottle case. I have one that is neoprene and looks like this one. That’s ok and is a nice color but when it’s sitting on a desk or traveling in the car it’s bulky and it doesn’t fit in the drink holder. I also have one that is similar to this one. Same things here. It has a nice pattern but will not fit in the cup holder in my car. These are actually both good solutions for my straight sided water bottles. My current favorite however is a stainless steel flip top bottle that is not straight sided. It has an hourglass shape and it really doesn’t work well in any of the holders. After a visit to Starbucks it occurred to me that I needed to make a wrap type cozy for my water bottle and I could start with the shape like they use for the cardboard wrappers for the coffee cups. After several trials with paper patterns I finally decided to make a test one and see how it works. It’s not really the shape I thought I would need but works surprisingly well. I also used velcro for a closure but this helped accommodate the hourglass middle. 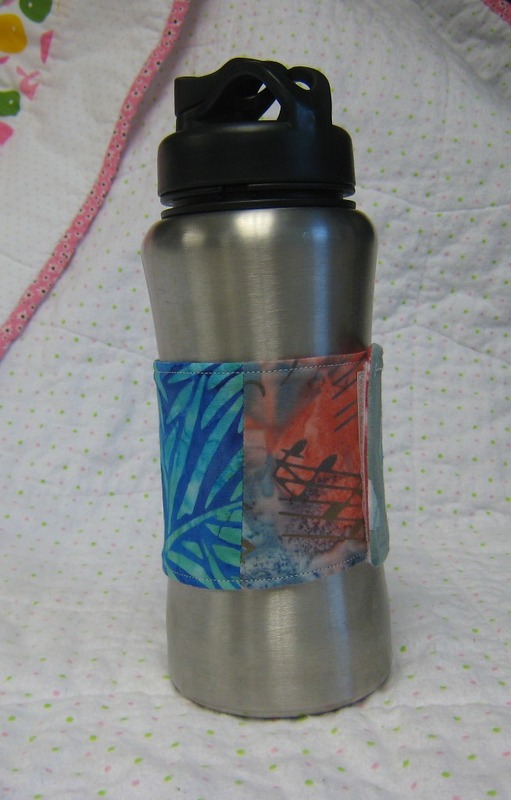 I was able to use a more curved shape to my pattern because I realized that the place I really needed the wrap was near the bottom of the bottle. I’ve used this for several days now and am pleased with the result. I love the colors. I just strip pieced some fabric leftovers until it was larger than my pattern piece and put a layer of warm and natural batting in the middle to soak up the condensation. It still fits in the cup holder in my car and doesn’t seem to leave any condensation around the bottom to make a mess. This water bottle cozy will be useful for a long time. My keys my keys. I don’t like to lose my keys! I’m usually – that’s 99% of the time certain where I put my keys. I do not ever allow time to search for them because I’m so consistent in the place they live. There has been a time or two that they have been misplaced but it’s rare. Well now I have one more key to keep track of. It will need to be in my purse because it’s to a new door that will be part of my regular schedule for a while. The dilemma is how to keep track of the key. I don’t want to put it on the key chain with my car key and my house key. I will not use the key more than a couple of times a week and it looks identical to my house key. I didn’t want to add the weight of a big key ring or a bulky key chain to my purse because it feels like I carry around more than I need anyway. 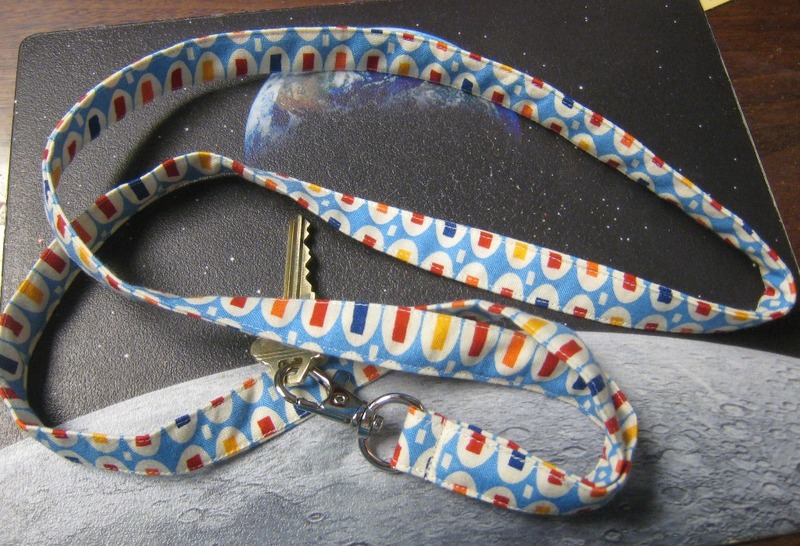 The solution is a lanyard. I have eyed these for a while and been anxious to make some more. I think they would be a good sale item as well and they are fast and fun to make. Well as fast as anything is that you have to cut and sew. I interfaced it so there is a bit of substance to it yet it is light and flexible and should be easy to find in my purse. It also is big enough that it will be easy to keep track of. All these are important criteria in my world. Problem solved and now it’s off to read for a bit before bed.